This Ongoing War: A Blog: 11-Sep-15: How devoted to non-violence are the villagers of Nabi Saleh really? 11-Sep-15: How devoted to non-violence are the villagers of Nabi Saleh really? of parent does that take? Nariman and Bassem Tamimi are the parents of the child now widely known in the social media as Shirley Temper. It's a name she earned by emerging as a child prodigy in the thrusting of clenched fists into the faces of impassive, well-disciplined, heavily-armed and incredibly-self-restrained IDF soldiers since she was a very little girl, long before she had the capacity to make any decisions about who, what, why or when to seem to be really, physically angry. The effect on large swathes of grown-up mainstream reporters, photo editors and commentators has been alarming. Instead of doing the responsible and obvious (in any other setting, that is) thing - which obviously would mean condemning the parents for their shabby and irresponsible manipulation of a pretty, blonde, very-non-Arab-looking prepubescent girl - they have issued the parents with a free-pass while upgrading the child to a pint-sized, pouty-faced version of historical female warriors like Queen Boadicea, France's Marianne and the Maid of Orelans. Given how often Palestinian rock-throwing attacks turn into firebomb showers and then shootings, stabbings and bombings, Nariman and Bassem Tamimi - both as parents and as full-time propagandists professing a somewhat confused message of non-violence and female empowerment in time of war - are playing with fire. Literally. As we have noted in this blog (here, for instance), Nabi Saleh has produced a serious number of murderers. It takes huge pride in that achievement. The culture of the town - a concept we have heard invoked numerous times in interviews with various Tamimis - is heart-and-soul aligned with those killers. The claim that the town is somehow more devoted to pacifism, less violent, worthy of special respect, is a dangerous, misleading, dishonest and knowing fabrication. And that's before we get into the open adoration of Nabi Saleh's population for the most accomplished of those homicidal terrorists - the woman who was convicted of the massacre in Jerusalem that stole our daughter's life in 2001. But leaving open adoration aside, we think there's a good case for viewing Ahlam Tamimi, the architect of the Sbarro massacre, as the litmus test for what Nabi Saleh and its Tamimis really mean, really believe.The article that now follows may do just that. Here is our translation of a Hebrew-language interview published a week ago. In it, Nariman Tamimi, Bassem's wife, drops her guard, sharing an attachment to murder and its role (significant) in her town's media-rich 'struggle'. No one has published an English version of this until now. We hope it gets plenty of exposure as Bassem Tamimi ["10-Sep-15: It takes a village: The passion for violence of the peace-loving Tamimis"] sets off to sell his somewhat mislabeled packaged goods to Nabi Saleh's US followers. But we have low expectations. The latest weapon of the Palestinians? Against the background of Palestinian reports about the investigation and rapid release a short time later of the parents of the Tamimi family from Nabi Saleh - the women who clashed with an IDF fighter have issued a call to Palestinian women to join the fight against the “occupation”. Nariman Tamimi, mother of Muhammad, the boy who hurled rocks at the soldier, and the boy’s aunt Nawal Tamimi, claim the Israeli army will not arrest women and children and that they should therefore join the struggle. In the discussion the two women had with nrg in the village of Nabi Saleh, they admitted to being satisfied with their release by the security forces since, in their eyes, it signifies victory. According to their approach, images of the IDF soldier struggling with women from Nabi Saleh last weekend and distributed throughout the world amount to a weapon against Israel. "Our hope is that other women in other villages will see our struggle and the victory, and that they too will join in the fight. When all is said and done, we won. We managed by stubbornness to prevent the soldier from taking my son away," says Nariman, the mother. The aunt and the mother made clear that in Friday’s incident, men were also present. They however feared being arrested if they would try to prevent the arrest of Mohammad. They therefore permitted the women to be at the center of the fight. "We knew the media were present, and that the army would not arrest women and children, and so I avoided arrest. We decided to try and prevent his arrest, and we did,” she admitted. "Women and children have always been a part of the struggle in Nabi Saleh, as opposed to what has happened in Qadoum, Bil'in and Ni'lin. Here, it’s a cultural thing, something traditional and educational, and also the fact that everyone in our village belongs to the one family numbering about 500 people and in reality there’s no alternative. But we hope that women seeing the photos in the media will understand their power and join in the struggle", she emphasized. The two women explained further that ''When the ‘enemy’ wants to shoot at us, he shoots at everyone without distinction: women, children, men. 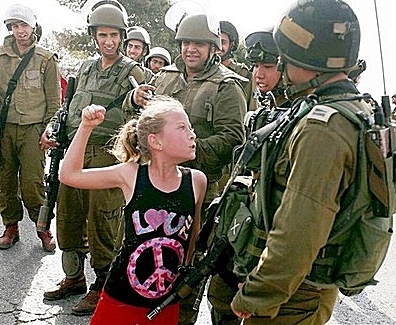 So we all need to be fighting against the occupation." One of the major Palestinian murderers who emerged from the village is Ahlam Tamimi who transported the perpetrator of the terror at Jerusalem’s Sbarro pizzeria. "What she [Ahlam Tamimi] did was an integral part of the struggle. Everyone fights in the manner in which he believes. There is armed uprising, and there is popular uprising. I support every form of uprising. I personally choose the way of popular uprising," explains mother Nariman. 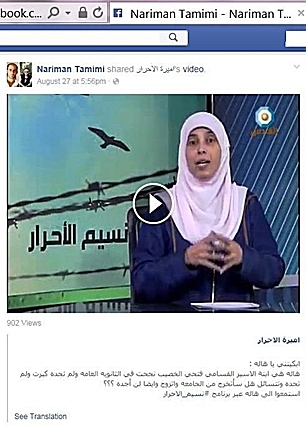 And lest anyone suspect that Mrs Bassem Tamimi, Um Shirley Temper, has any actual reservations about the particular form of "uprising" chosen by her cousin, the homicidal sociopath Ahlam Tamimi, a quick glance at the Nariman Facebook page, with images like the one on the right, will soon put that matter to rest. Like virtually everyone in the hateful village of Nabi Saleh, she holds to the view that the confessed, boastful and unrepentant murderer Ahlam Tamimi is a celebrity, a hero, a figure to emulate in the literal sense. People who go along to hear Bassem Tamimi in the United States ought to ask him and themselves whether his answer to the following question (we have been circulating it the past week - see "04-Sep-15: Mr. Human Rights Defender, a question if we may") gives them the kind of moral comfort that lets a person of conscience sleep at night. Bassem Tamimi, tell us in simple words: are you as delighted by your cousin Ahlam Tamimi's massacre of Jewish children as she is? Have you criticized it ever, anywhere? Will you condemn it here and now? Bassem Tamimi and the mother of his abused children are the stuff of our nightmares. If people understood them better, they would probably have the same problem we do.